Many of you know that in times of tragedy I tend to feel the need to write in order to find some clarity in my emotions & peace in my mind. When Princess Diana, Walter Payton, John F. Kennedy, Jr. died, when Columbine happened, I wrote you to share my thoughts & express my grief. And each time I thought: “I can’t imagine feeling any worse in my life than I do at this moment.” And yet here we are again. I woke up the morning of Tuesday, September 11, 2001, with a sense of dread. I had a feeling that something bad was going to happen. I don’t know why. I stumbled into my living room, turned on the TV, the volume low & went into the kitchen to grab some juice. As I glanced over my shoulder at the TV I thought, “Well, there’s a trailer for a movie I WON’T be seeing: “Armageddon-Independence Day-Rambo Does NY”. What else could I possibly think I was seeing, as I watched a commercial airplane explode into the World Trade Center on a clear & sunny September morning? I went into the bathroom, turned on the radio & stepped into the shower. Then I heard these words: “This day will go down in history as the most tragic in our lifetime”. I turned the water off, ran into the living room, turned up the volume on the TV, & sat on my couch where I remained in shock for the next 48 hours, remote control in one hand, phone in the other, box of tissues by my side, my kitty on my lap. In times of tragedy, as cliché as it may seem, the country suddenly feels a bit smaller & undoubtedly more united. And yet, as much as we are compelled to feel a sense of national pride, to wave our flags & sing the anthems that we know almost all the words to, we must not forget that we are not a perfect land. We allow unspeakable horrors (racism, sexism, child abuse, etc) to occur on our own soil everyday. While many nations stand united with us now in our time of need, these same allies have valid concerns about our polices as well. We cannot ignore this fact. And it is vital for us to acknowledge that there are people in this world who have hatred towards our country so immense that they would be driven to orchestrate such an act as the one that occurred on Tuesday. We may never understand it, but it is REAL & as much as we feel the need to “retaliate”, we will NEVER end the evil pattern of terrorism until the issues that motivate these horrors are addressed. There are no easy answers. So what are we to do NOW? Right now I don’t know what or how to feel. Numbness is all my psyche can seem to handle. Everywhere I go, every face I see, looks the same: blank expressions. There is no sparkle in anyone’s eyes. Not one person is smiling. Everyone looks as if they have the weight of the world on their shoulders, deep in thought & heavy of heart. I feel as if the muscles in my face that used to allow me to smile have been paralyzed permanently. It seems implausible to think we will ever be joyful again. & our grieving hasn’t even Begun to reach its apex. as a nation & as a people. They are indestructible – Period. 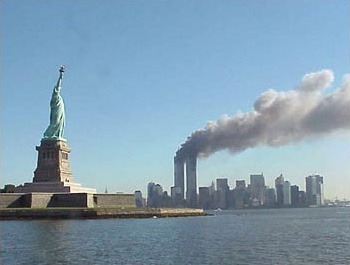 they really should have just stayed home on Tuesday, September 11, 2001. Their mission was NOT accomplished. Whenever tragedy strikes we each must struggle to find the blessing amidst the devastation. Yes, we are lucky that we are safe & alive. I am thankful that no one that I know of, thus far, was injured or killed. Those are the obvious blessings. But life will never be the same for any of us. It cannot be. Every time tragedy strikes we say, “I promise to live life to its fullest, as if today could be my last. To cherish all the wonderful gifts I’ve been given & hold a bit closer to my heart my loved ones”. because you were a part of it. Where were you 30 years ago today when you heard? Lulu, you just blew me way again. thank you for making me believe in people again, I’ve had a bad day, forgive me. I know. I still get confused when I see the NY skyline. It USED to be that you could recognize it right away by the Towers; now I have to look at it for a second before I realize it is NY. The other thing that always gets me is thinking about the deaths of all the first responders because they actually went into the buildings to save people. Having grown up in NJ watching the NY news almost every night because my parents had it on, NY firefighters were my true heroes growing up. To hear that hundreds were snuffed out in an instant still gets me chocked up. Great piece thanks for sharing. Before I moved down south I worked in Newark, NJ. It was a difficult time in my life because I was in a bad marriage at the time and bad job. On of my few points of solace during the day was driving down RT 22 or I 78 and seeing the Manhattan skyline with the twin towers right in front of me. On some days seeing that skyline was the high point of my day. Sure they were only two buildings but they also were symbols of America’s standing in the world at one time.